A former cartel operative told the US trial of Joaquin "El Chapo" Guzman Tuesday that he bribed a former Mexican cabinet minister with millions of dollars stuffed into two suitcases and hand delivered in a restaurant. Jesus Zambada, a government informant held in US custody since 2008, said the bribes were delivered in person to Genaro Garcia Luna, Mexico's former public security minister, in 2005-2006. Zambada said the Sinaloa cartel also bribed Gabriel Regino, at the time a senior police official under Mexico's now president-elect Andres Manuel Lopez Obrador when the latter was mayor of Mexico City. The sum? A "few million dollars" in 2005. Zambada said Regino was bribed to secure the cartel's "protection." Regino swiftly denied on Twitter ever receiving a bribe from Zambada. The witness alleged that at the time of the first bribe, a suitcase stuffed with $3 million, Garcia Luna, was a senior official in the attorney general's Office, a position he held from 2001 to 2006. At the time of the second installment of $3-5 million in 2006, he was in the federal cabinet under then president Felipe Calderon as public security minister, which meant that he presided over Mexican federal police. Zambada made the revelations under cross examination from Guzman's defense lawyer William Purpura on his fourth and final day of testimony. In his opening statements at trial, the defense charged that the Sinaloa cartel had bribed Mexico's outgoing president and his predecessor. Guzman, considered the world's largest drug trafficker since the death of Colombia's Pablo Escobar, is on trial in a federal court in Brooklyn under draconian security arrangements after twice escaping from prison in Mexico. His trial is now into a second week. On Monday, Zambada testified how Guzman ordered at least six deaths, including of a rival who refused to shake his hand, and the rival's wife. 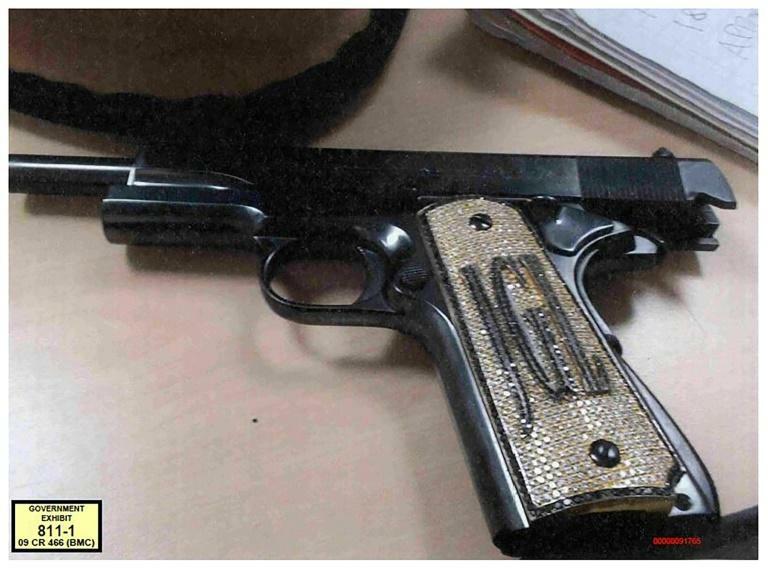 US prosecutors also admitted into evidence the diamond-encrusted pistol emblazoned with Guzman's initials.